Baylor Group, a live engagement agency, was chosen as Honda’s exhibit partner for the 2019 Consumer Electronics Show (CES). Las Vegas, NV, January 10, 2019 --(PR.com)-- Baylor Group, Inc., a live engagement agency, was chosen by Honda to provide a customized show stand for attendees of the Consumer Electronics Show (CES) to be held at the Las Vegas Convention Center in Las Vegas, January 8-11, 2019. For the past 50 years, CES has been known as the world's gathering place where next-generation innovations are introduced to the marketplace. Baylor Group provides creative, modular architectural structures for indoor and outdoor events, trade shows, festivals and global brand activations, and was asked to create an innovative space to display Honda’s ground-breaking, new ideas and technologies which focus on mobility, robotics and energy management solutions that support and enhance people’s daily lives. The 10,400 square foot (80’x130’) exhibit will be located at the Las Vegas Convention Center’s North Hall, booth 7900. 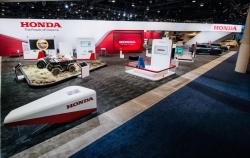 The Honda event space, designed by Baylor Group, will feature concept videos, multimedia kiosks and presentations of robots, wireless charging applications, connected vehicle technologies and an off-road autonomous vehicle. Other showcase items will include Honda Innovations Silicon Valley (HISV) connectivity using AD/ADAS, 3D sound advancements In addition to the developing the booth display, the project also required Baylor to manage logistics for the show, construct private meeting spaces, provide a data capture system for lead management, advise on staffing and uniforms and also create some custom content. "Helping to bring Honda’s brand promise of using intelligent mobility solutions to enable people to improve their daily lives was a challenging, but fun, project for us to fulfill," said Mike Croke, President of Baylor Group. "We were able to create an immersive and unique space that is the perfect environment for CES attendees to interact and engage with the company’s technology offerings and truly experience the future of connected transportation and integrated vehicle-to-grid applications." Visit www.ces.tech for information about the conference and online registration. With offices in Southern California and Southeastern Michigan, Baylor Group Inc., a live engagement agency, creates integrated marketing solutions for indoor and outdoor events, trade shows, festivals and various other global brand activations. We specialize in both live and digital communications and solutions which allow our client’s customers to experience their brands and become immersed in the attributes and values they uniquely represent. Whether a large and established company, or an up-and-coming challenger, the Baylor Group can bring your brand to life. Find out more at www.BaylorGroup.com and follow us on Facebook and Instagram. Click here to view the list of recent Press Releases from Baylor Group Inc.